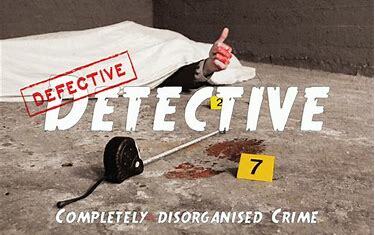 Can you solve the case of the Defective Detective? One of our most popular rooms to date is alive and kicking however the victim isn’t. There has been a murder! However the detective has come to the completely wrong conclusion. You must gather your own team of detective friends and family and try to solve who the real killer was before he hands in his case at Police HQ. Quite possibly one of the most ridiculous investigations you might find yourself on, expect lots of laughs and surprises along the way! This is one you really won’t want to miss! We have wanted to do this one for a while. We meet at one of Panic Rooms usual locations and this time are escorted by our lovely host in to a flat they have exclusively for this game. He goes over a few ground rules before the game begins as and provides us with some gadgets we may need to crack the case! Although not as visually spectacular as some of their other games, what they’ve done with the space is still impressive. There is a red herring in this one, but it is an obvious red herring, as they will explain to you before you go in. The puzzles are really good. A couple in particular stood out to us and gave a real sense of achievement when we completed them (but maybe that’s just us). The story is the main part of this room. You’re trying to solve a murder so you do have to pay attention but we liked that as sometimes the puzzles take over and the story can get lost a bit. We cracked the case in a good time, although could’ve been quicker if we didn’t always second guess ourselves! There are some really good pieces in this room and we highly recommend giving it a go, especially if you also like murder mysteries. There were 5 of us and we all had stuff to do so 2-5 probably all good numbers in our opinion.